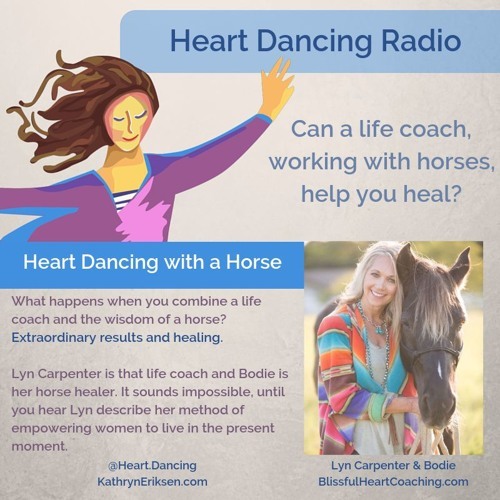 Lyn Carpenter has an unusual profession - she is a certified life coach, but she uses horses to guide and heal her clients. It's hard to believe, but when you hear her describe the incidents where the horses knew exactly what to do, your doubts will disappear. Lyn is a gentle woman with a fierce desire to support women in mid-life. She is certified in the Equine Gestalt Method and firmly believes that horses heal and clean energetic blockages. She describes the process as "the horses take the pain and shame, and they don't hold on to it. Instead, they drop it in the dirt." It's an amazing process that has helped women overcome trauma, abuse and even anxiety. You can find out more about Lyn at her website: BlissfulHeartCoaching.com. After learning about Lyn's work, I was hit by a sudden realization. Working with Lyn Carpenter is like Heart Dancing with a horse!